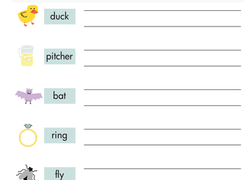 This homophone worksheet encourages your kid to learn with a fun monster story. Use this homophone worksheet to help improve spelling and vocabulary knowledge. Use this resource to assess your students’ mastery of determining word meanings by utilizing context clues and an understanding of homophones and homographs. Kids use context to figure out the meaning of words. In the third installment of this narrative series, the family finally reaches their destination. Here's a helpful lesson on homographs! Students can learn about words that are spelled the same, but have different meanings. Choose the correct spelling (and meaning) between two words that sound the same in sentences. Use this exercise to help your student identify the correct homophone to use in a sentence. Pick one thing from each of the "My Vacation series," then draw a picture to show what is happening. 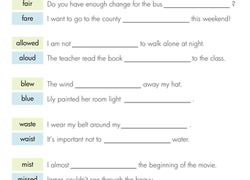 This homograph worksheets gets your kid to learn about words that are spelled the same but have different meanings. Try our homograph worksheet with your child. This worksheet will help strengthen your students' word definition skills. Homonyms are words that are spelled and pronounced the same but have different meanings. Give your child some homonym practise with this fun activity in which they'll seek to match the correct word meanings to homonyms being used in context. This printable will challenge your child's understanding of "homographs", or words that looks the same as another words, but means something different. Set your sights on this spelling worksheet about words with '-ight' as the suffix, and you just might start to get it right. In this spelling test, learn the difference between '-ate', '-eight' and '-aight' by practising some common words that use these letter combinations.